Our partners at the FVPA will be putting together 2 teams this year to face off vs our very own Sweetpatch TV in the 2nd Annual tournament. The tournament will run beginning January 21st with signups beginning immediately. Medals will be awarded to the winning teams! 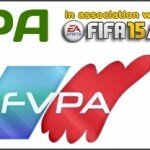 You can check out all the build up to this tournament over at the home of the FVPA and also the home of our FIFA tournaments, leagues and clubs over at mySweetpatch.TV.